. 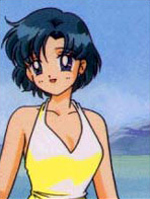 : Lunar Palace v.5 - USA: Sailor Mercury :. In Episode 73, Ami attends a second school for smart students called Albert Einstein School.